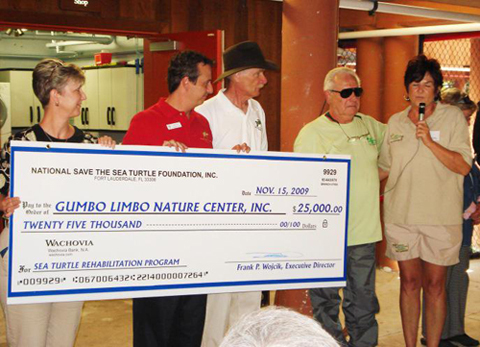 Frank Wojcik and Helena Schaff presented check to Gumbo Limbo. The National Save the Sea Turtle Foundation presented Gumbo Limbo Nature Center, Inc., with a $25,000 check to support its new Sea Turtle Rehabilitation Program. “We are happy to begin a relationship with The National Save the Sea Turtle Foundation. Their donation has helped us to surpass our fund raising goal for the initiation of our sea turtle rehabilitation program, and we look forward to a partnership on future projects,” said Mike Zewe, Development Officer for Gumbo Limbo Nature Center, Inc. In addition to the check presentation and ribbon cutting ceremony for the rehabilitation program, the Greater Boca Raton Beach and Parks District will honor Gumbo Limbo founder, Gordon Gilbert with a commemorative plaque which will be unveiled and permanently placed at Gumbo Limbo. “The rehabilitation program will not only help sick and injured turtles but will raise public awareness of the threats these animals face. The program will add another layer to the City’s sea turtle research and conservation program which will greatly enhance our conservation efforts, “ said Dr. Kirt Rusenko, Boca Raton Marine Conservationist. Gumbo Limbo Nature Center is currently celebrating 25 years of coastal and marine education, preservation, conservation and research. The center is a collaborative project between the city of Boca Raton, the Greater Boca Raton Beach and Park District, the School District of Palm Beach Country, Florida Atlantic University, and Gumbo Limbo Nature Center, Inc., a 501 (c) (3) organization.